You Cannot be Serious – But that's Family Law! ​You Cannot be Serious – But that's Family Law! As was widely reported in the national media the Court of Appeal gave its decision on the appeal of Tini Owens against the decision not to allow her to have a divorce based on her husband's unreasonable behaviour. Despite huge criticism by the Court of Appeal and in particular the President of the Family Division Sir James Munby the Court of Appeal went along with the original Court decision that Mrs Owens should not be able to have a divorce. This was the case where the original Judge effectively thought that the allegations of unreasonable behaviour made by Mrs Owens were normal for marriage and she should just effectively put up with it. Sir James Munby made specific reference to the manipulation that often goes on to achieve a divorce based on unreasonable behaviour with parties exaggerating or on occasions even giving incorrect information so as to get a divorce. However the Court of Appeal would not go so far as to overrule the original Family Court's decision because effectively that is the law! We are left with a very out of date process for a divorce that is based on only one ground which is the irretrievable breakdown of a marriage. However to show that breakdown this can only be done in one of five ways. For an immediate divorce that can only be based on adultery or unreasonable behaviour and that is where the dilemma lies. A husband or wife needs to "blame" the other to obtain a divorce and to raise very often what can be very emotive issues about behaviour. What is sufficient to be classed as unreasonable behaviour to allow a divorce is much more difficult to define. Over the years best practice has always been not to say all that could be said so as to avoid making a difficult situation even worse. The Court of Appeal has now effectively said that must end and there is a scary prospect of much more intensive detail being given about unreasonable behaviour to avoid the risk of the Family Court refusing to allow a divorce to take place. And yet recently it has been reported in the press that the Ipswich Family Court allowed a divorce based on a row over Marmite! But is this what husbands and wives want? Whilst the case of Mr and Mrs Owens is an extreme one the vast majority of divorces do not currently result in the divorce itself being defended. Whilst it is very rare for there to be an agreement on a divorce the reality is that one party very often has to acknowledge that because the other wants a divorce it is going to happen. Pragmatic positions have to be taken because little is often served in a very expensive "fight" over whether there should be a divorce at all as only the lawyers realistically benefit from very large legal costs. So what is the solution? No fault divorce remains on the agenda of Resolution and is a high priority. It works successfully in other countries where the emphasis is on dealing with financial repercussions and arrangements for children – not the actual divorce itself. If a marriage is over should the Court stand in the way of a couple wanting a divorce? Whilst there are those that would say that at the moment it is too easy to get a divorce by way of the manipulation that Sir James Munby refers to in reality is there any good reason to keep a couple married if one of them does not want to be in that relationship. Does it not take "two to tango"? The Government has indicated that it has no plans to introduce no fault divorce. We are therefore left with the current fiasco of no one really knowing what is sufficient to be classed as unreasonable behaviour to give good reason for a divorce. In very extreme situations it will be obvious but in more borderline ones are we now faced with a situation where people are going to exaggerate details of their relationship and try even harder to blame the other. Is that not going to be even more of a manipulation of the law? The Norfolk Good Divorce Group is a combination of collaborative lawyers, mediators and arbitrators. They are all Resolution members and their aim is to try to defuse divorce situations and to find more constructive outcomes for couples going through a separation or divorce. 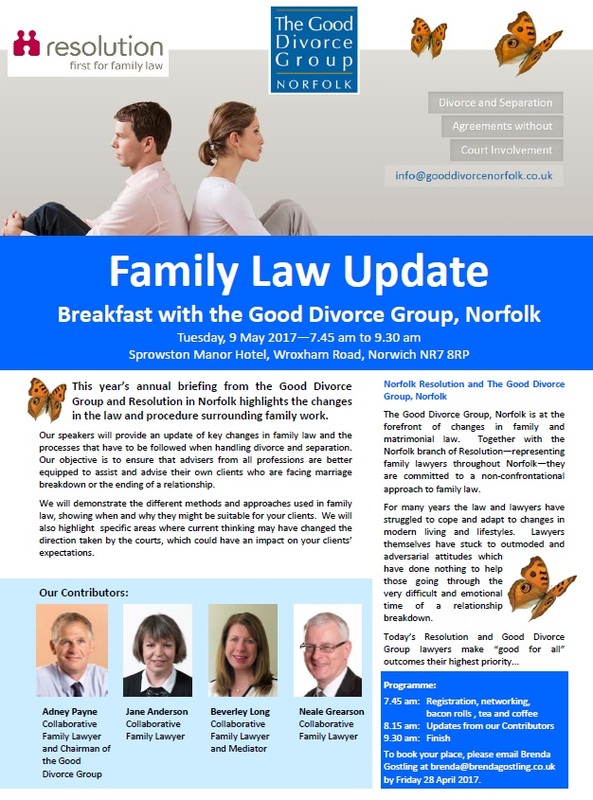 This year the Group is holding a "Family Law Update" on Tuesday 9th May over breakfast at Sprowston Manor Hotel, Wroxham Road, Norwich. The aim will be not to just update on family law developments but also to look at the different areas of what is called Alternative Dispute Resolution (ADR – collaborative law, mediation and arbitration). 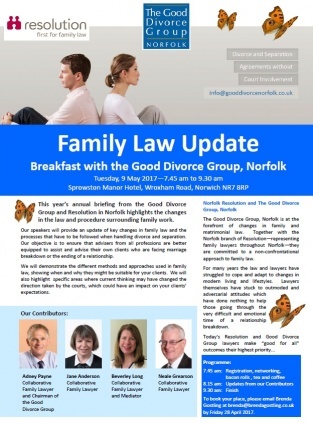 The event is free to attend, anyone interested in attending should contact Brenda Gostling on brenda@brendagostling.co.uk The content of the presentations will be of particular interest for those who are involved in the family law field whether that be by advising clients that are going through relationship or marriage breakdown or those professionals who wish to know more about the family law framework. Of course there will be an opportunity to ask questions about "no fault divorce"! But please - no questions about Marmite!!! To find out more or discuss your individual requirements in further detail, our dedicated Family Law Solicitors are on hand to offer legal advice and support. Contact us today on 01603 693500 or email us using the 'Make an enquiry' form. Appointments available at our Norwich, North Walsham, Brooke and Sheringham offices.